Wisconsin's Emblazoned (a great moniker, by the way) deliver a punchy Norsecore on their EP The Living Magisterium. The name of the game is brutal punishment on this release combining rabid Swedish black metal with the US death metal styled breakdowns. Imagine a hybrid of Marduk and Malevolent Creation, when Extinction of Creation barges in right after deceptive intro Premonition. The drill is unrelenting on Bound by Eternal Penance, whereas Refuge in Darkness has Emblazoned guitars doing swirls and twirls around D-beating drums with a cool melodic slowdown along the way. 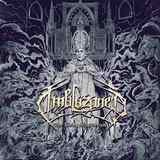 Emblazoned are at their best when they come up with monumental riffs as in the closer In Ex Cathedra. The things basically all come together for the band on that song. Melodic faster moments, stretchy guitar distortions on the leads - sure it isn't revolutionary, but well-crafted and a strong quality statement. Emblazoned vocals adhere to a dual black/death style the rest of their music represents. A lot of them are delivered with deep bottom-of-the-gutter deathy voice, but there are also higher screams with vocalist Jeff Plewa probably assuming both roles. The Living Magisterium did not have me on my hands and knees begging for more Emblazoned, but for the fans of brutal music this EP can provide for a satisfying listen.